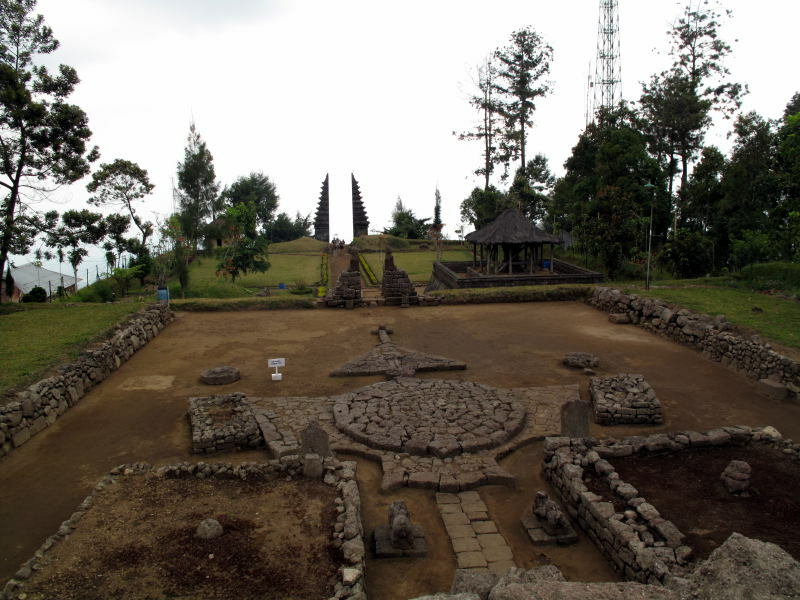 Candi Ceto sits on the slopes of Mount Lawu, about 15 kilometers away from Candi Sukuh, or 40 kilometers from Solo. The drive to Ceto is quite nice, as you move through steep hills covered with tea bushes. Unlike Candi Sukuh, which was built around the same time, Ceto looks more like the kinds of Hindu temples you will still see today in Bali. As at Sukuh, sexual images can be seen in some of the decorations of this temple, although they don't dominate here like they do at Sukuh. The temple layout consists of a series of terraces that climb the side of the hill. The first enclosure you enter is large and flat, with stone decorations on the ground depicting male and female genitalia, as well as what appear to be zodiac signs. The next two terraces hold shrines to various deities. The highest terrace holds a pyramidal altar that's a bit more refined than the one at Sukuh. A gate leads from the side of the next-to-last terrace to a trail that will take you to another old Hindu temple, Candi Kethek, as well as a modern altar to the goddess Saraswati.